Amongst the many lessons I learned in the Army was that war, on an individual basis, is nothing more than a violent game of survival. The thoughts of glory and all the other high ideals leave as soon as the bullets start flying. From then on, all you want to do is survive until your hitch is up. While the Army doesn’t teach survival classes per se, they do teach a number of skills intended to help individual soldiers survive. They also provide a wide range of equipment and supplies with that same intention. The average soldier on the line doesn’t realize it, but officers are taught that the lives of their men are valuable and that they are to do all they can to conserve those lives, while still completing their mission. As an officer, I received this training, but it wasn’t until years later that I realized how much effort the Army puts into ensuring the survival of their soldiers. Even the little things, like the combat rations we were issued, were designed with survival in mind. Today, the Army issues MREs, which stands for “Meals, Ready to Eat.” Anyone who has been through boot camp will tell you that this is “three lies for the price of one.” Those were just coming in when I was going out. Back then we had C Rations, which were canned food. Along with the cans of food was an “accessory pack” which was where the Army’s attention to detail on survival really shone through. Army coffee, at least the type we had back then, has triple the caffeine of regular coffee. That’s to help the soldiers stay awake. Falling asleep on guard duty was a serious offense, one that could cost you your life in a combat zone. In combat, they slept on the buddy system, with one man sleeping, while his buddy kept guard. That way, half the unit was awake to repel any sudden attack in the night. Coffee is also useful for fighting hypothermia. When someone’s body temperature starts to drop, it is imperative to raise it back up again. One of the common methods taught for this is to give them hot liquids to drink. Not only will coffee transfer heat to their body, but the caffeine will stimulate the metabolism, causing the body to generate more heat. Like the coffee, chewing gum can help one stay awake and alert. Just the simple action of chewing is enough to keep one from dozing off. But chewing gum has another purpose in a combat situation, it’s a fairly descent way of cleaning your teeth, when you can’t brush them. Granted, it’s not as good as a toothbrush, but chewing gum will remove most of the buildup on the teeth, as well as the food between them. Okay, I know that cigarettes have been found to be a cause of lung cancer, but they were included in the C Rations, at least for a few years. Like the coffee and chewing gum, they help those on guard duty stay awake, but cigarettes teach us another lesson as well. In combat, like in prisons, cigarettes become the medium of exchange for a barter economy. In many survival situations, bartering is a more valuable means of trade than money. If there is no way of using the money you receive, why in the world would you want it? Cigarettes, like many barter goods, can be used by the person who receives them (at least, they can if they smoke). The simplest fire starter there is. While these were paper matches, they were chemically treated to make them waterproof. There’s nothing more useless than wet matches, when you have to start a fire. By including them in every meal, the Army ensured that soldiers always had a means of starting a fire, even if they were using some of them to light their cigarettes. While most survivalists collect fire starting methods like some people collect baseball cards, the Army didn’t want to count on soldiers’ ability to start a fire from what nature provided. So, in addition to providing matches, they also provided Hexamine fuel tablets. Small folding stoves for use with the heat tabs were provided as well, although they weren’t included in the C rations themselves. These would burn for several minutes, enough to heat up the C rations. Warm food is much more comforting in a difficult situation than cold food is. While the C rations weren’t any healthier to eat warm than they were cold, being able to heat them was important for morale. Food in general is important for morale and warm food has been shown to have a more positive effect on morale than cold food. You can still get these Hexamine fuel tablets, as well as several models of folding stoves from Esbit, a German company. We all know that what goes in must come out, so the Army prepared for that in the C Rations. While that may not seem to be necessary for survival, it is important for morale and morale (one’s attitude) is important to survival. Including toilet paper in the C rations helped the troops feel better when they were in the field and needed it. Toilet paper also has other uses, as it can be used as excellent tinder for starting fires. It is also useful for making bandages, when one is needed for small cuts. The need for water in a survival situation cannot be overstated. But it’s not just any water that we need, we need purified water. Although the troops were expected to fill their canteens from a water buffalo (trailer) or lister bag, they were also provided with water purification tablets, as an emergency backup. Few liked to use them, as they made the water taste bad. You’ve probably seen those videos of how to open a can of food by rubbing it on a cement sidewalk, just as I have. While that will work, I’d much rather use a can opener. C rations came packed with several P-38 can openers in each case. These could be shared, but most of us kept one on our dog tag chain. I’ve carried a P-38 on my key ring, ever since I went through basic training. To me, the P-38 follows the Boy Scout rule of “be prepared.” Having one on my key chain ensures that I can always get into a can and eat its contents. I don’t need to rub it on cement or try to stab it with a knife. The P-38 is easier than both. I can’t say how many times I’ve used mine through the years. While salt and pepper may not seem like survival items, these tie in with the fuel tablets I mentioned above. Flavorful food is much more likely to be eaten than bland food. When one is tired and not feeling good, a little motivation to eat can’t hurt. It’s interesting to note that in the hottest countries in the world, the food tends to be spicier. One theory that has been presented for this is that the hotter, spicier food motivates people to eat, when the high ambient temperature would otherwise reduce their desire to eat. I’m not sure if this is true, but if it is, then there’s a good survival reason to have spices in our MREs. Of course, salt is necessary for survival anyway. Working or fighting in a hot climate will make one sweat, losing salt from their body. A ready means of replacing that salt helps to keep the person properly hydrated, as the salt is what holds water in our bodies. Well, there you have it; the Army’s basic survival kit, included in every ration served to the troops. 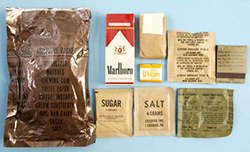 Many of these items are still supplied with the current MREs, although a few, like cigarettes, have been dropped. Those that have been retained show the timelessness of some of these survival lessons. Ciggies are a good form of bartering, even though I don’t smoke them. Being from alaska, I had to know how to stay warm, and find ways and things to barter for things like food, and warmth! Great article, as always! I have to agree with him! He is dead on! Frozen c-rats caused severe cramps, so you did need to heat them. When it is below 0°F C-rations will freeze in the can. You decide at breakfast what you want for lunch and put it inside your clothing next to your undershirt. Same for dinner and breakfast the next morning. C-rations can be eaten cold. When the daytime temps never go above 0° no amount of hexamine will heat them. The best you get is body temp which is good enough. Lots of time hot coffee was brought up in big square insulated cans, otherwise you couldn’t get the water hot enough to make coffee or hot chocolate. Ate the hot chocolate like candy and washed it down. Always had to keep your canteen inside your clothing too, otherwise it froze also. While the P-38 “John Wayne” can opener/screwdriver is a neat little piece of equipment, I prefer the P-51. I believe it was found in the old K-rations. It’s bigger to give you more leverage. What it did do was keep us fed well enough to keep putting one foot in front of the other.